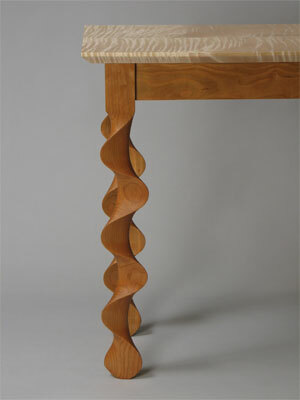 This console table features aprons and carved legs in cherry and a highly figured top in curly maple. Mortise and tenon construction. 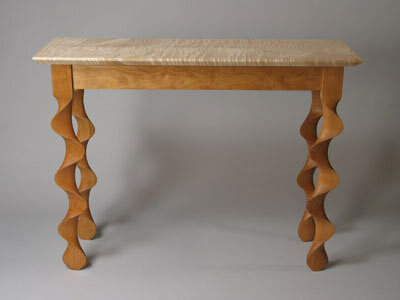 This table won a design award in the 4th annual Vermont Fine Furniture and Wood Products Design Competition in September 2007. A true craftsman, David Hurwitz designs and builds contemporary furniture pieces, one at a time at his studio in central Vermont, using hand carving along with traditional methods of furniture construction and joinery. His work has been exhibited widely in galleries and museums throughout the United States, including the Houston Center for Contemporary Craft, the Delaware Art Museum, and the Wharton Esherick Museum. His work is in public and private collections throughout the United States, and in private residences in Canada and England.